On 14 March 2018, we celebrated the longstanding relationship between the Australian High Commission of Ghana and the OTC. This joyous occasion was held to officially hand over equipment donated to the OTC’s new Day Care and Therapy Centre for children with Cerebral Palsy by the Ghana Australia Association. Our honored guests included Mrs. Therese Barnes, wife of the Australian High Commissioner, Ms. Claire Maizonnier from the High Commission, and Mrs. Elizabeth Muntar, a representative of the Ghana Australia Association. Members of the Ghana Australia Association not only located this special equipment, but they also packed and paid for the shipment to Ghana, including the clearance at the port. This was no small task because, as you can see from the photos, the cartons for this equipment were not small! OTC is so grateful to the Ghana Australia Association for raising the funds to help us as we build the only centre in the Nsawam community area where children with cerebral palsy can be treated with physio and occupational therapy. A limited number also stay for the day so that their parents can work. The children who are in our daycare are given transportation, meals, and their afternoon bath before returning home in the evening. OTC Director Sister Elizabeth Newman SSND attended a conference a few years ago. It was there that she learned some staggering statistics about cerebral palsy. In the developed world one child is born with cerebral palsy in 500 live births. However, here in Ghana the rate is much higher at one in every 300 live births. The great need for help was obvious, as the number of children being brought to the OTC for care kept increasing. As always, OTC stayed true to its core mission: to care for children with orthopedic needs, no matter what. With determination, hard work, and many organizations coming together in support, the new daycare center opened. Now it has specialized wheelchairs, standing equipment, and positioning seats, all sized for children. Some are even made to look like small animals, very attractive and child friendly, encouraging the children to use them. The key to the early success of the new centre is the involvement of the parents. Those who come faithfully, learn from the therapists how best to work with the children in order to help them overcome their challenges. Moms and even some Dads come, but it is mainly the Moms who are the leaders in care. The love they have for their children is great. You can feel it when they bring their children into the centre. They are patient, they laugh and play with their child, and they are eager to learn more about their child’s needs. The work has only just begun, but with leadership from the OTC, the expertise and compassion of dedicated therapists, and support from organizations like the Ghana Australia Association, the center is off to a running start. That combination, together with strong and faithful family love, guarantee that the new OTC Centre for Children with Cerebral Palsy will achieve its mission of making a significant, positive change in the lives of those it serves. This entry was posted in Events on March 21, 2018 by OTC Ghana. Founder’s day is all about getting together and having fun. 4th of December was the founder of OTC Br Tarcisius’ birthday. After his demise, we have marked it as founder’s day which will be celebrated every year. A day the OTC family will come together to dine and have fun. Last year’s celebration was at the OTC beach house in Prampram, Greater Accra region. This year it was held here at Nsawam on our premises. We had indoor and outdoor games. They included Soccer, Ludo, Draft, musical chairs and wheelchair tennis training. There was competitions between the college and OTC. The results are: Ludo, OTC won; Draft, OTC won; Musical chairs, BTPOTC won, and ultimately OTC won the trophy for the soccer game. It was full of laughter and fun. OTC, all children are God’s gift! This entry was posted in Events on December 4, 2016 by OTC Ghana. 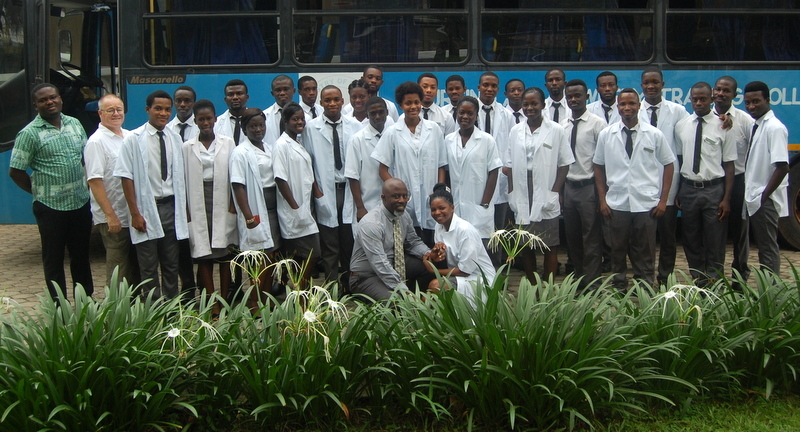 The students from Brother Tarcisius Prosthetic and Orthotic Training College went on a field trip Thursday to visit the Prosthetic and Orthotic Facility at St. Joseph’s Hospital in Koforidua. The visit was primarily to see how Prosthetics and Orthotics are carried out at a hospital, compared to an out-patient setting. St. Joseph’s we were told is mainly an Orthopaedic and Trauma Hospital. It has 200 beds and is owned and operated by the Brothers of Saint John of God. They have a new Orthopedic Building which was opened in 2010. We were given a tour of the entire facility. Each Department told us how they fit into the scheme of the entire treatment plan for patient care. Then we were allowed to see some patients in the Orthopedic Building who were mostly victims of Trauma. There were 3 amputee’s who spoke with us about their recovery and plans for a prosthesis. The Physio Therapy Department was very active while we visited it. All forms of Therapy were occurring. Amputees were receiving gait instruction. Stroke victims were receiving muscle strengthening and retraining, and others were receiving electro-therapy treatments. We realized how an intervention with a more modern approach to amputation surgery such as a Immediate Post- Operative Fitting Prosthesis would benefit the trauma amputees. The ready accessibility to Physio and a well-trained Prosthetist would also greatly enhance the rehabilitation for this type of patient. We visited the Orthotic and Prosthetic Department which was our main reason for going to St. Joseph’s. It was very informative. We were surprised to see so many of the tools and machines used at OTC in use there. In fact there facility is as well-equipped as the OTC. They have a large oven. A large band saw, a well-equipped router and sewing machines. A M.I.G. welder and all the necessary hand tools and machinery to perform Orthotic and Prosthetic and Pedorthtic work. The ability to see how and why Prosthetics and Orthotics contributes to the rehabilitation of the in-patient, right from the acute stage of care, was demonstrated to the students. It helped give them a sense of understanding and importance of the role they will perform in the treatment of P & O clients in the near future. This entry was posted in Events on April 7, 2015 by OTC Ghana.